We often hear facts about recycling that we all find interesting. Below is compilation with the most intriguing recycling paper facts with the possible savings and benefits that come from it. Every year the average American uses almost 700 pounds of paper. That means that about 465 trees will be used by an American on average during his/her lifetime. The publication of the US Sunday newspaper consumes half a million trees every week. In 2011 the paper industry has managed to recover almost 53 million tons of paper which is an increase of around 2.5% compared to 2010 and brings the recovery rate at approximately 67%. The recovery rate of paper from 33.5% that was in 1990 it has reached 66.8% in 2011 which is almost double of what it was. According to EPA US consumers use 71 million tons of paper and paperboard. Paper accounts for one third in weight of the amount of waste that is recycled in the country. This also translates into publishing 350 million magazines, 2 billion books and 24 billion newspapers per year. A ton of paper occupies in a landfill 3.3 cubic yards. Paper cannot be recycled indefinitely like glass. The reason has to do with the fibers getting shorter every time we recycle it. It is estimated that after recycling paper 5 to 7 times its fibers get so short that you can no longer bond them to create paper. Thus new fibers are needed to make up for the unusable fiber. This means in a sheet of paper recycled and new fibers might exist. 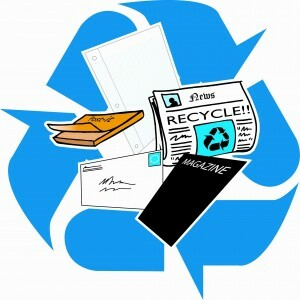 During 2010 recycled paper accounted for 37% of the paper used to create new paper products. The pollution caused from producing paper from recovered one is only a quarter compared to the production of brand new one. If Americans would recycle their past year phone books that would mean a saving of 650 thousand tons of paper. Paper and cardboard make up almost three quarters of landfill materials. A ton of recycled paper equals 17 mature saved trees. Around half of the office paper is only recovered. For every 15 thousand tons of newspaper that is recycled on an annual basis 70 jobs are created. Thirty jobs are for collecting the newspaper and another forty for processing it.